Deportation, to most people, conjures up the image of a foreigner physically removed from the United States. In reality, however, it is a court process, oftentimes, a prolonged one, during which, every immigrant has a right to an attorney and all possible defenses. Even if this process ends up with a physical removal from the US, and it doesn’t have to end that way, it should happen at the end of a course of an appeal. Deportation is not only a domain of illegal immigrants, apprehended by the immigration police or border patrol, while crossing the border illegally, at a roving traffic check point or through a raid on the place of employment. It also affects permanent residents of the US, sentenced for criminal offenses. After serving their sentences in a state or federal prison, they are automatically transferred into the custody of immigration officials and are processed through a deportation system before the Immigration Court, without leaving detention. A bond, in such cases, is only rarely granted. It is different in the case of “regular” illegal aliens. Most often, they appear before the Court out of their own volition, after posting a few thousand dollars bond or even without that. Similarly, with persons, whose employment or family sponsorship is doomed, (especially when they are prepared by home-schooled legal experts), and their applications for permanent residence are denied by the Immigration Service. There are also known examples of denials, without any basis or merit, which nevertheless still lead to an initiation of deportation proceedings. The initiation of deportation, so called “Notice to Appear”, is nothing less than a detailed account of charges against a particular foreigner. These charges and alleged immigration violations must be fully proven by the government attorney, the prosecutor, before an Immigration Judge begins the proceedings. At least, that is how it is supposed to be in theory, but the reality might be different. 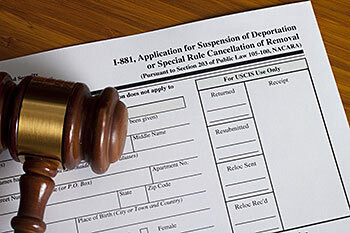 Many immigration judges are recruited from the former government attorneys and may tend to be partial in their rulings. It is therefore very important, that the attorney who represents an alien in deportation proceedings, is not only a competent lawyer, but also a very watchful one. It is good to remember, that deportation is not the end of the world. If someone truly qualifies for permanent residence, based on his or her sponsorship, then in most cases, the Immigration Judge will be more than willing to grant a case before the Court. Sometimes, it is better to proceed with a more complicated case in Court, rather than administratively, before the USCIS, because the level of competence and intelligence of an immigration judge or a government attorney is immeasurably greater than an average immigration official. Chances of successful completion of such a difficult case are then increased substantially.